The tiny black figure of an oncoming steamer. It’s still far away but distinct, classic in its own way. It leaves a useless trail of smoke in the air far behind it. Unbound presents the Portuguese poet FERNANDO PESSOA regarded as one of the most important poets of the 20th century. F. Pessoa (1886-1935) was born in Lisbon and lived shortly in Durbai, South Africa, after which he returned to Lisbon. He started writing poetry in 1914. Playing with fluid notions of identity, he often used various literary personas as distinct literary figures apart from writing under his own name. Although he invented many heteronyms, he mainly signed his work under the three following heteronyms: Alberto Caeiro, “a rural, uneducated poet of great ideas who wrote in free verse”, Ricardo Reis, “a physician who composed formal odes influenced by Horace”; and Álvaro de Campos, “an adventurous London-based naval engineer influenced by poet Walt Whitman and the Italian Futurists” (source: Poetry Foundation). Of the three main heteronyms used, most critics agree that Álvaro de Campos (born on the 15 October 1890 in Tavira, Portugal) is the one that is probably closest to Pessoa’s personality. Á. de Campos is the one who feels most strongly, his motto being ‘to feel everything in every way.’ ‘The best way to travel,’ he wrote, ‘is to feel.’ His poetry is the most emotionally intense and varied, constantly oscillating between two fundamental impulses: on the one hand an intense desire to be and feel everything and everyone, declaring that ‘in every corner of my soul stands an altar to a different god’ (alluding to Walt Whitman’s desire to ‘contain multitudes’), and, on the other, a wish for a state of isolation and a sense of nothingness. Pessoa died when he was 47 years old, on November 30, 1935 in Lisbon. 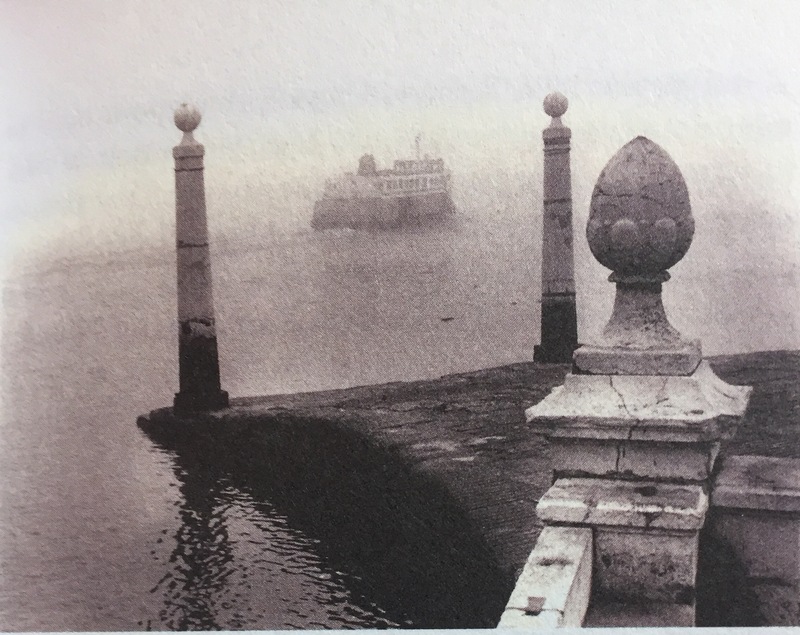 Some critics have discussed the question of what memories of Lisbon are being explored and rewritten in Pessoa’s writing on the city. Is he writing about the city that he left before moving to to South Africa or about the one that he returned to later in his life? According to the critic Maria José de Lancastre, the city represented in Pessoa’s / de Campos poems is the one of the mythical city of his childhood.2 The city to which he returns after South Africa remains mainly unwritten, although Pessoa uses an external topography of places he resided in or visited, argues de Lancastre. At the same time, the city of Lisbon is reconstructed ‘a posteriori’ as an imagined city that has acquired a purely mythical dimension. At the same time, the city of Lisbon is reconstructed ‘a posteriori’ as an imagined city that has acquired a purely mythical dimension. It is primarily the interior topography of the poet that is being expressed in his writing. Although nostalgia is also related with sadness and absence, it cannot evidence the complexity of saudade. Nostalgia is a weaker feeling, something like a fog within the poet’s spirit, more close to an idea of melancholy instead of the pain which is also joyful within ‘saudade’ (…) ‘Saudade’, however, is a very deep disposition that structures the subject and appeals to a group of other emotions that conjugate with each other in a very definite way. There is a desire for something lost or absent, a wish of returning and this wish referent may be anything at all, that leads to a sadness initiated by that absence. A close textual reading of Pessoa’s writing shows the author’s propensity for an incredibly varied number of voices, styles and personas that are characteristic of his writing.4 The excerpts of the poems ‘Lisbon Revisited’ written in 1923 & 1926 shown below are an example of his varied writing on the city.. They plunge the reader into the poet’s interior space that gives rise to the rewriting of his native city and its transformation into a myth. — Of science, of the arts, of modern civilization! You give me nothing, you take nothing from me, you’re nothing I feel is me. And as long as Silence and the Abyss hold off, I want to be alone! I want fifty things at the same time. Of a fitful sleeper, half dreaming. All abstract and necessary doors were closed in my face. I found the alley but not the number of the address I was given. I woke up to the same life I’d fallen asleep to. Even the armies I dreamed of were defeated. Even my dreams felt false while I dreamed them. And yet again have come back? A series of dreams about me dreamed by someone outside me? With a heart that’s more distant, a soul that’s less mine. But, oh, I cannot see myself! A piece of you and of me! Jasmina Bolfek-Radovani Mina Ray, 7/5/2018. Àlvaro de Campos (heteronym), “Maritime Ode”, 1915. Maria José de Lancastre, Fernando Pessoa, Lisbonne revisitée, Anthologie (bilingual Portuguese & French), Paris: Chandeigne, 2017. For further reading of Pessoa’s work see: F. Pessoa, Message, 1934; B. Soares (heteronym), The Book of Disquiet, 1982 (published posthumously); À. de Campos (heteronym), ‘Maritime Ode’, 1915; À. de Campos, ‘Lisbon revisited’, 1923; À. de Campos, ‘Lisbon revisited’, 1926. Other writings published posthumously and translated into several languages include “Poesias de Fernando Pessoa” (1942), Poesias de Alvaro de Campos” (1944), Poemas de Alberto Caeiro” (1946), and “Odes de Ricardo Reis” (1946).